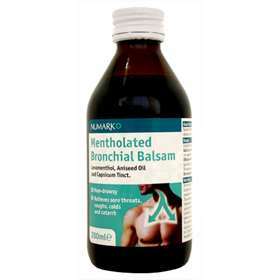 Numark Mentholated Bronchial Balsam - Non-drowsy - Relieves coughs, colds and catarrh. An oral solution for the symptomatic relief of sore throats, coughs, colds and catarrh. Adults, the elderly and children over 12 years old: 2-3 x 5ml spoonfuls 10-15ml every 2-3 hours. Children from 6-12 years: 5-10ml every 2-3 hours. Children under 6 years of age: Do not give not suitable for children under 6 years of age. Consult your doctor or pharmacist before use if you are pregnant or breast-feeding. If you have been told by your doctor that you have an intolerance to some sugars, contact your doctor before using this medicinal product. Contains 1.9g of sucrose per 15ml dose. This should be taken into account in patients with diabetes mellitus. This medicinal product contains 2.6 vol% ethanol (alcohol), i.e. up to 306 mg per 15 ml dose, equivalent to 7.7 ml of beer or 3.2 ml of wine per 15 ml dose. Harmful for those suffering from alcoholism. To be taken into account in pregnant or breast-feeding women, children and high-risk groups such as patients with liver disease or epilepsy. Menthol 1mg, Aniseed Oil 3.5mcl and Capsicum Tincture 25mcl per 5ml. Ginger, Oleoresin, Clove Oil, Peppermint Oil, Glycerin E422, Glucose, Sucrose, Tragacanth E413, Benzoic Acid E210, Caramel E150c, Benzoin Tincture, Tolu Tincture, Ethanol and Purified Water.